Officially known as the F.M. 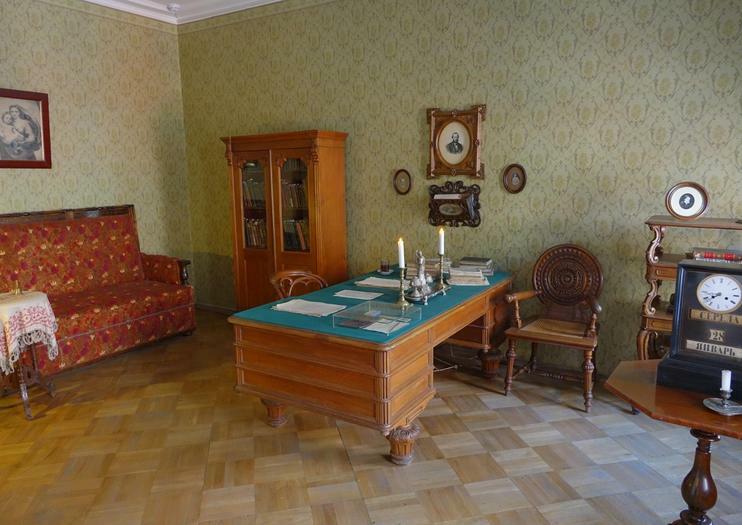 Dostoevsky Literary Memorial Museum, this museum celebrates the life of Russian author Fyodor Dostoevsky. It was opened in 1971 in the apartment where he lived first in 1846 and again from 1878 until his death in 1881. Notably, it is also where he penned his last novel, the Brothers Karamazov. The interior has been reconstructed based on recollections of Dostoevsky’s wife and friends and includes memorabilia donated by his grandson. A literary exhibit focuses on Dostoevsky’s life and work, while exhibit halls occasionally display contemporary art. The museum library holds about 24,000 volumes and museum collection also includes a large collection of graphic and applied art and a collection of photographs. Every November, the museum hosts a conference on Dostoevsky and World Culture. It also hosts bus and walking tours of St Petersburg focused on Dostoevsky’s works and the city. The Dostoevsky Museum is located at 5/2 Kuznechny Pereulok. From the Vladimirskaya Metro station, exit and turn right and walk for one block, where you will find the museum on the corner of the building on your right. It is open Tuesdays to Sundays, 11 a.m. to 6 p.m. Admission is 160 rubles and photo and video are free. An audio guide is available for an additional 170 rubles. Visit the apartments of acclaimed Russian novelist Fyodor Dostoevsky. Having lived in the same building as a young man, Dostoevsky moved back with his family later in his life to live out his final years. The museum is divided into two sections, the first follows his early life and the second is dedicated to what is considered his mature period. Delve into St Petersburg's cultural history with a private tour of both the Alexander Pushkin and Fyodor Dostoevsky museums—the former homes of these two literary masters. Beginning at the Pushkin Museum, explore the final lodging place of this incredible poet and founder of modern Russian literature. See the carefully preserved apartment and peruse its various exhibits. Then continue onto the Dostoevsky Memorial Museum, where the famed author of Crime & Punishment lived until his death in 1881. Choose this private tour if you have already been to St Petersburg or want to escape crowded places and do something special. During this excursion you will see the museums and palaces of the city that are not usually included in standard touristic routes. Enjoy the collection of impressionists in the General Staff Building, discover local culture during a guided tour of the State Russian Museum and marvel a unique collection of Faberge Eggs in the Faberge Museum. On the second day, head out of the city to visit the summer residence of Pavlovsk, a family nest of Paul I. You will have a guided excursion to the Pavlovsk Palace as well as a walk in the park, which is the largest landscape park in Europe. Once back to St Petersburg, visit Dostoyevsky Memorial Museum or take a sightseeing boat tour (your choice).